Full lace cap wigs with stretch lace tab at the ear are similar to the full lace cap wig with ear-to-ear stretch but instead they come with a small stretch (elasticated) panel (tab) at each ear only, with the rest of the lace wig cap (including the crown) being made from lace. The small stretch tabs will always be a different colour to the lace because it contains elasticated material but it will still be breathable. 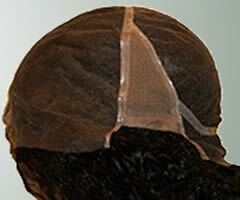 This type of lace wig cap construction means that the stretch tabs can add an extra half inch to the given circumference of a wig – it’s important that your chosen retailer tells you how much stretch there is. The standard medium cap size of 22.5 inches for a full lace wig should fit a head of up to 23 inches. The stretch tabs at the ears are also more robust than the rest of the lace and can be used as to adjust the wig when putting it on. This is another easy, full lace wig cap construction to use and is a great option for those who are new to wearing full lace wigs as well as being popular with those who have worn them for some time. Adhesive is not used for the stretch tabs at the ears – this does not make the wig less secure as the lace is glued from the temples, around the front of the hairline, as well as from just behind the ears and around the nape of the neck. As stretch tabs are located above the ears, you can part your hair through the middle (a half up, half down style, canerows, pigtails and so on) without anyone realising it’s a wig. It's easy to be enticed into all sorts of options for your full lace wig cap construction, without really knowing whether you need (or even want) the all singing, all dancing version.